There’s a little chapel in Wales with wooden angels. “I think I’m in love!” exclaimed Rebekah, and she couldn’t stop smiling. 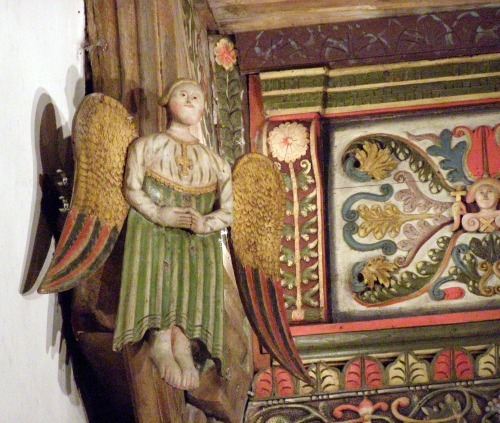 There were wooden painted angels everywhere, on the walls, the ceiling and carved into the roof trusses. They all peered out at her, following her every move in their tiny home. Rebekah had never seen anything like it. These angels felt alive! On the walls too were delightful paintings in the wood, with angel faces and designs. “Wales is certainly an enchanted place!” said Rebekah. She had come for a visit from Canada with her magical Prince of Powys. She had first met Llewelyn on the hilltop with the ruins of the ancient Castell Dinas Bran in Llangollen, and they had fallen in love again after being apart for centuries. She knew instantly that he was her lost prince and they had reunited in delight. Now, they were back in his homeland and Rebekah was loving every minute of it. There were chapels all over this land of the Celtic saints. And castles. And ancient ruins. Everything here was steeped in history, of thousands of years.